Did you miss out on last weekend’s San Diego Comic Con? 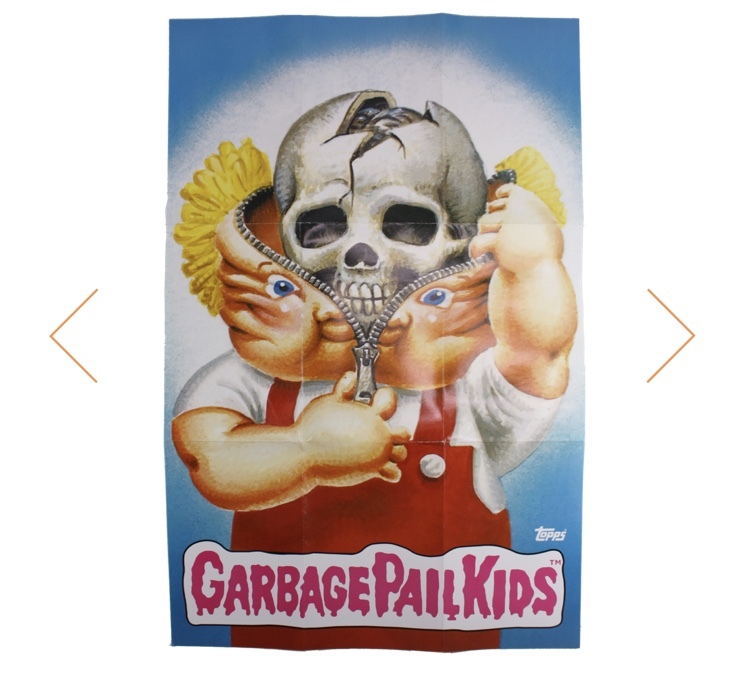 Creepy Co. has you covered. 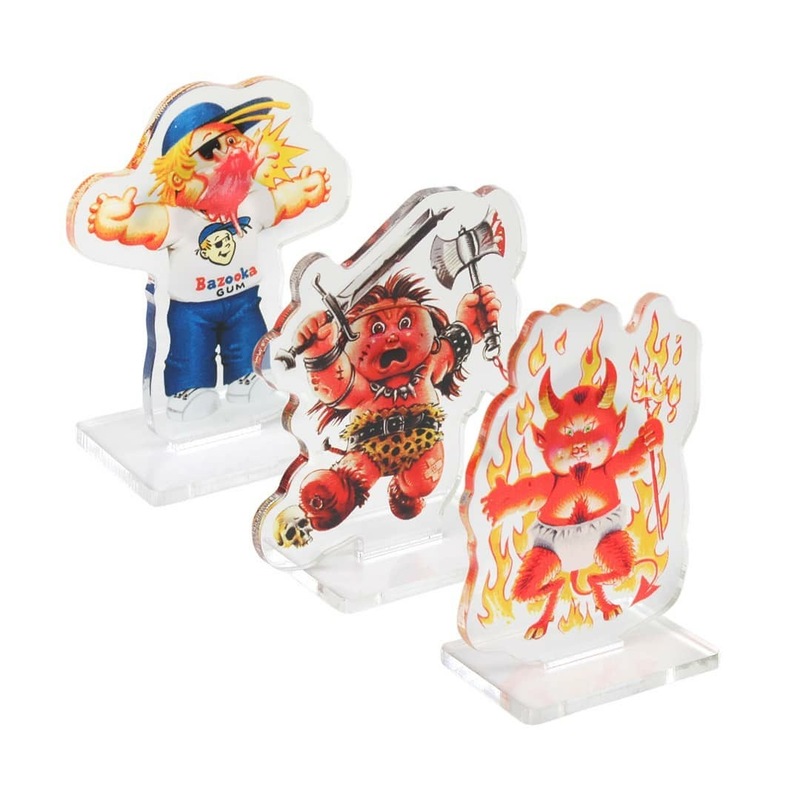 They posted this evening on their social media channels that their previously exclusive to SDCC items will go on sale via their website tomorrow. 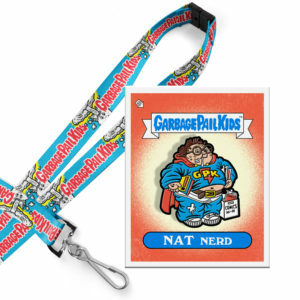 Beginning tomorrow at 7:00 PM (Central), Creepy will be offering both the pin and the t-shirt. They warn that supplies will be limited. 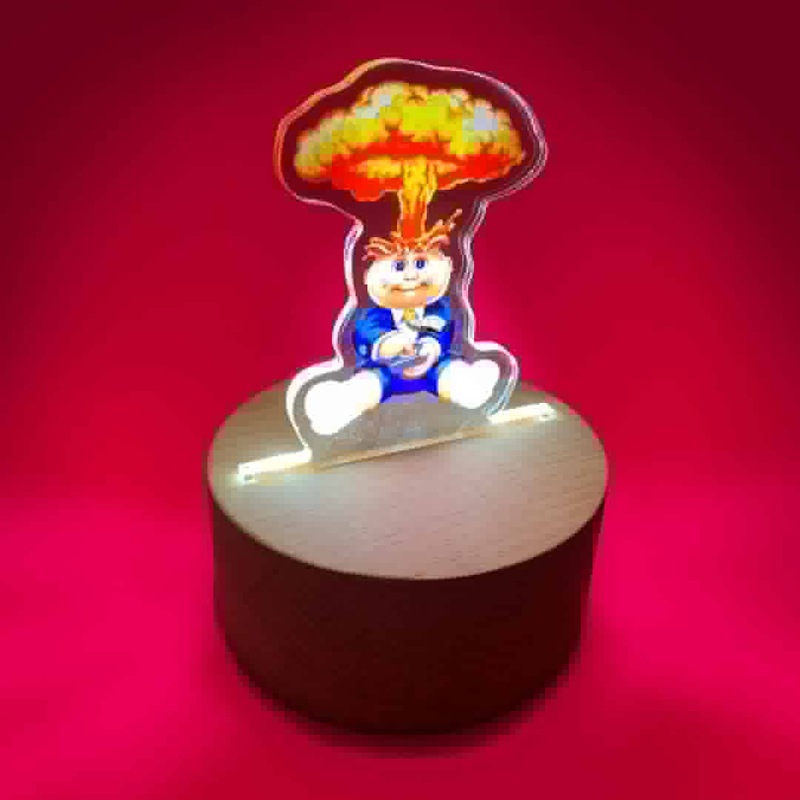 So if you want one of these items don’t delay. 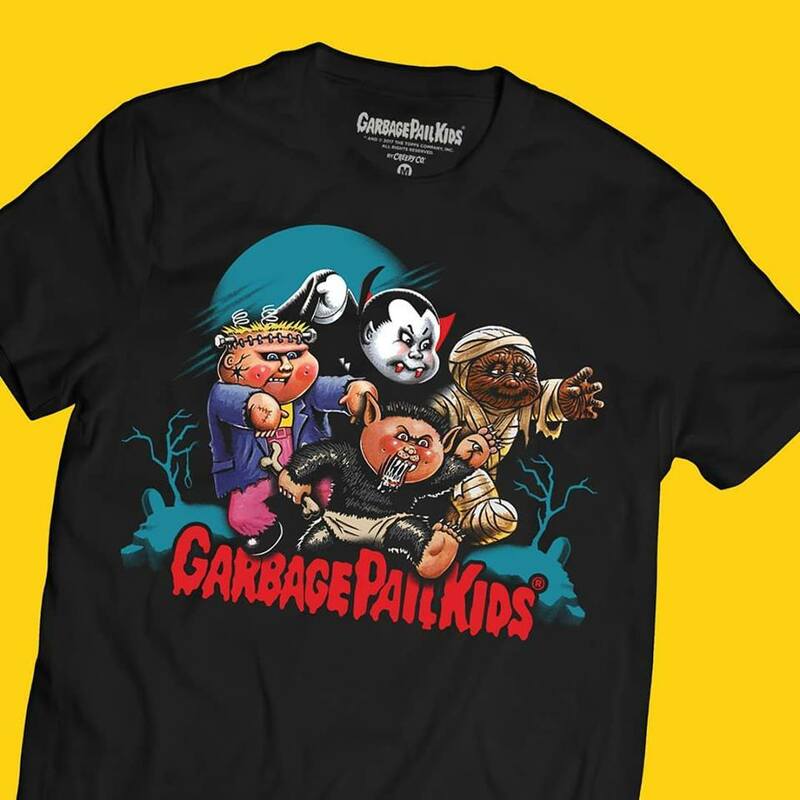 In what they are calling a mini-release, today Creepy Co. will launch two new shirts to their line of Garbage Pail Kids merchandise. 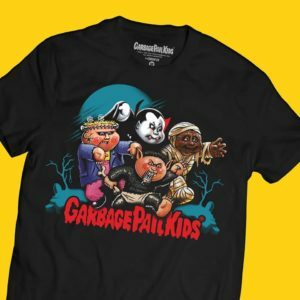 The shirts are scheduled to go on sale on Creepy’s website at 7:00 PM Central time, (5:00 PM Pacific/8:00 PM Eastern). 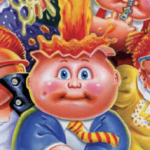 Creepy Co. has continued to use their GPK license with Topps in new and different ways. 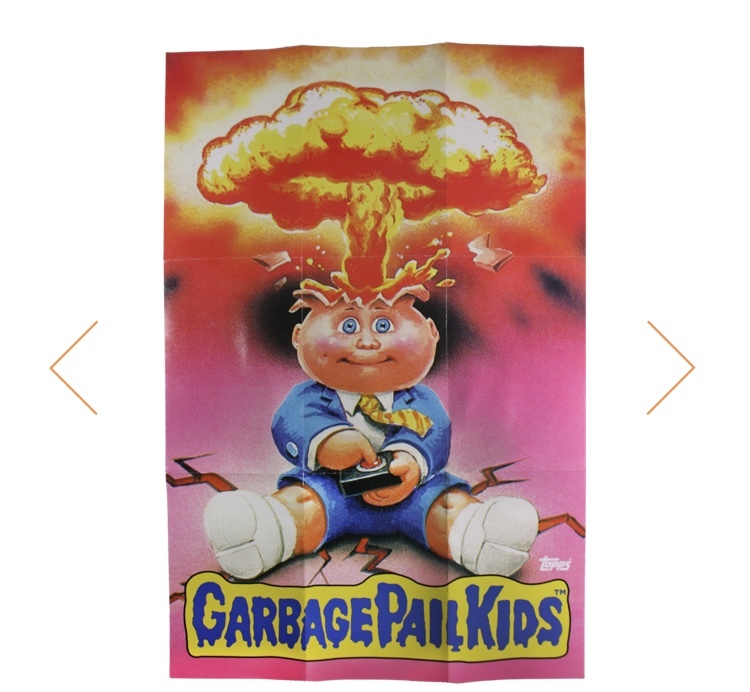 Today’s launch marks a couple of firsts for the company with GPK merchandise. 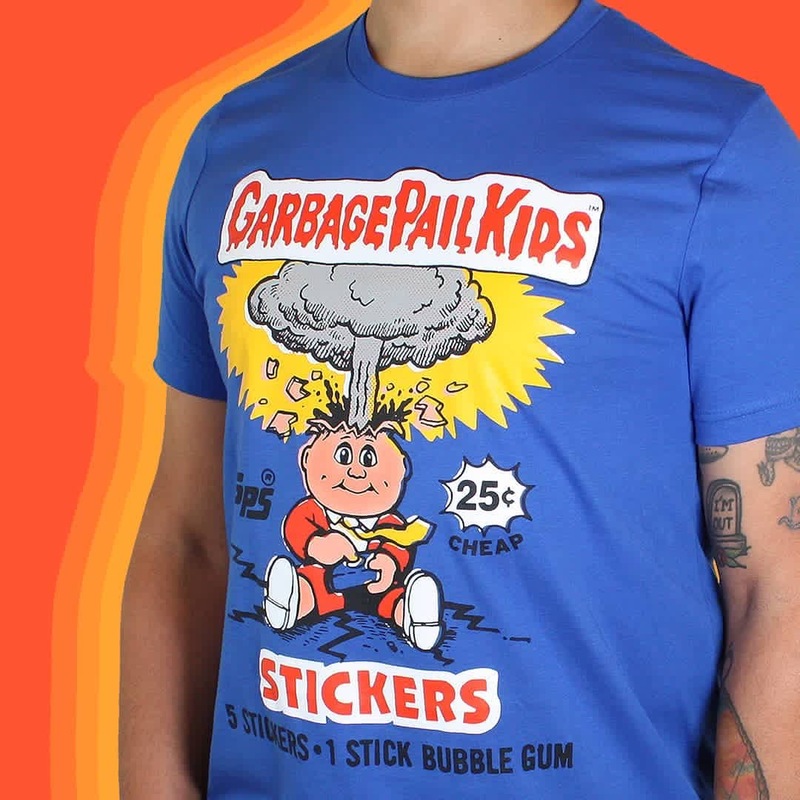 The first shirt being offered is the Garbage Pail Kids 30th Anniversary Motif Shirt. 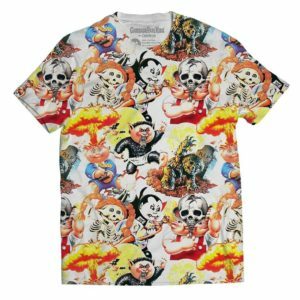 This is a black t-shirt featuring Joe Simko’s artwork that appeared on Checklist card 1a/b in 30th anniversary set. This 100% cotton shirt also features a Creepy Co. logo tag on the sleeve. 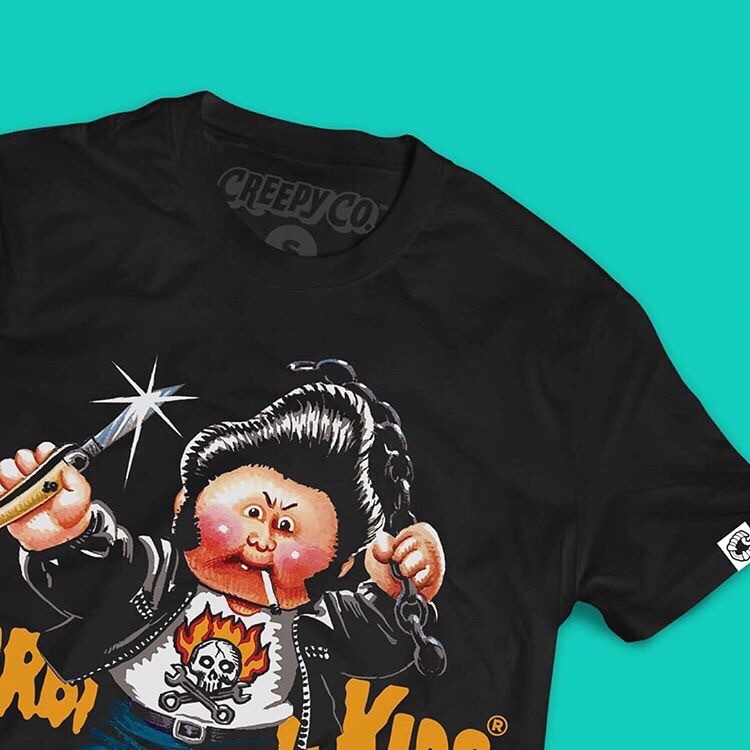 This marks the first t-shirt being offered by Creepy Co. 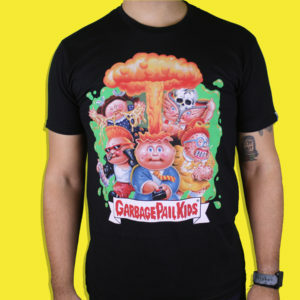 Previously, Creepy didn’t hold the GPK license to produce t-shirts. 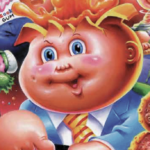 It appears that Creepy Co. has taken over that portion of the GPK license as well now. The shirt is available is sizes S-XL ($26.99), 2XL ($27.99), and 3XL-4XL ($28.99). The second shirt is also a first for Creep Co. 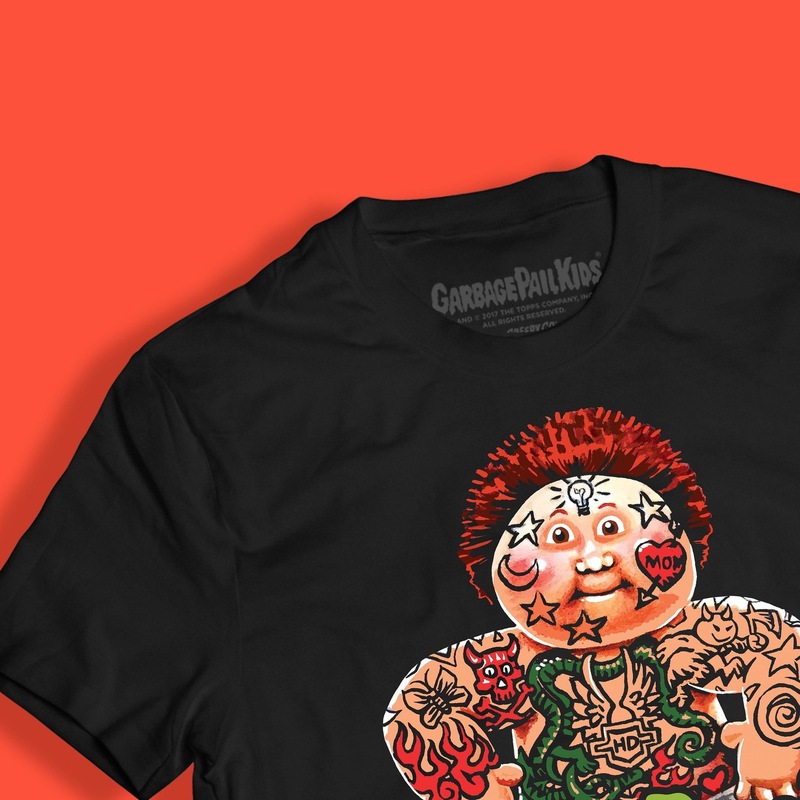 The Garbage Pail Kids Pattern Print Shirt is a dye sublimated, front and back allover print, on spun polyester, unisex shirt. 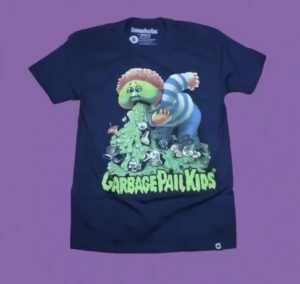 This is the first time Creepy has used this method on a shirt. 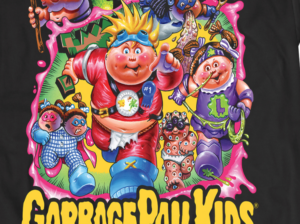 The shirt features the characters Bony Tony, Dead Ted, Eerie Eric, Nasty Nick, Bony Joanie, and Adam Bomb. One word of warning from the company, “The pattern print shirt runs small: customers are advised to read the product description carefully. 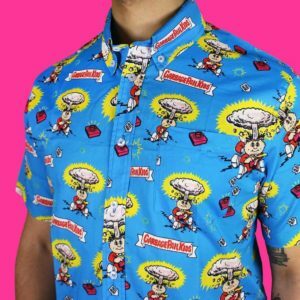 These are stretchy and comfy for sure, but depending on how you like your shirts to fit, you may want to order a size up.” The company also warns this shirt will be available in limited quantities. The shirt is available is S-4XL for $34.99. 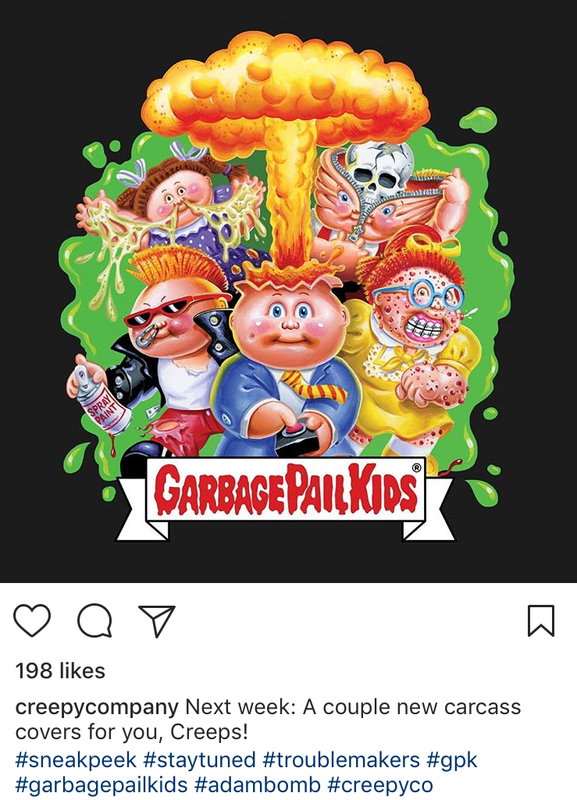 Update: Creepy Co. confirmed this morning they will have two new GPK themed shirts available. The shirts will go on sale this Wednesday at 7:00 PM Central time. They revealed the first design today. 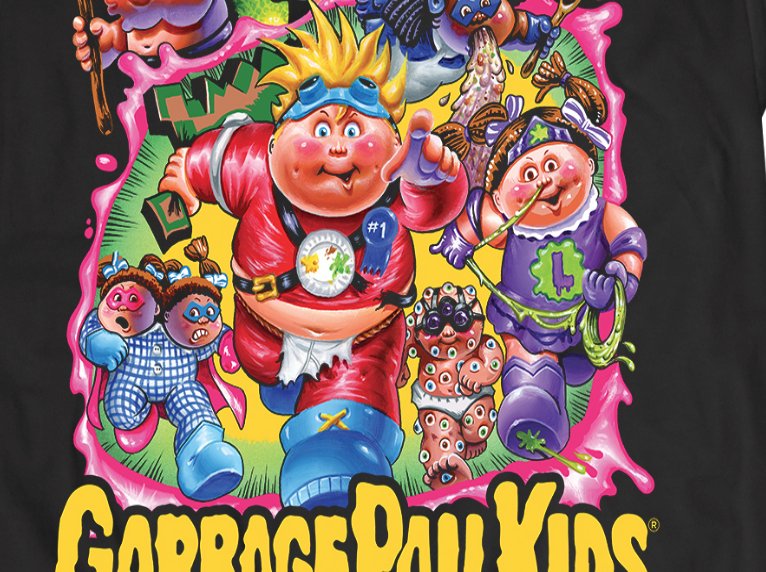 The shirt features many popular GPK characters throughout. 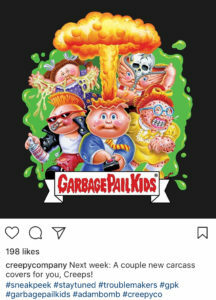 Creepy Co. began teasing new GPK merchandise for next week via their Instagram account. Stay tuned for updated pricing and release dates. Post updated 12/7 with additional details and pictures on pins, zipper pulls, jackets, and shirts…Everything is now on sale, go get you some! 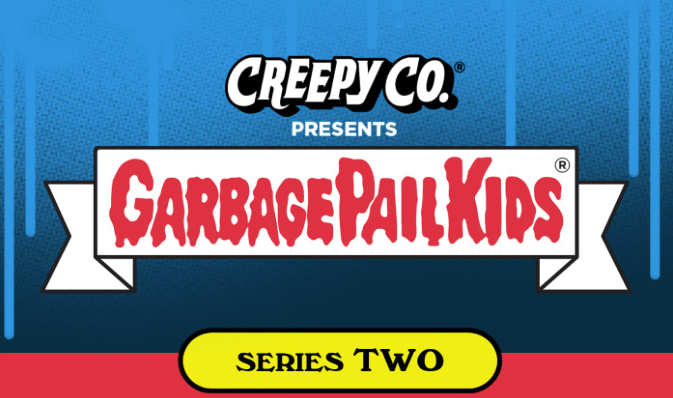 After a couple days of teases, Creepy Co. tonight revealed all their Series 2 GPK products being offered this Thursday, 12/7, at 7:00 PM Central time on their website, creepycompany.com. Here is a rundown of details they’ve revealed so far. Update – Everyting is now available. 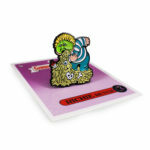 Series 1 Enemal Pin Boxed Set. 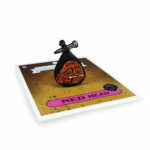 Did you miss out on the Creepy Co. enemal pins the first time around? 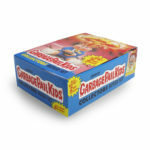 All five original pins are part of this box. 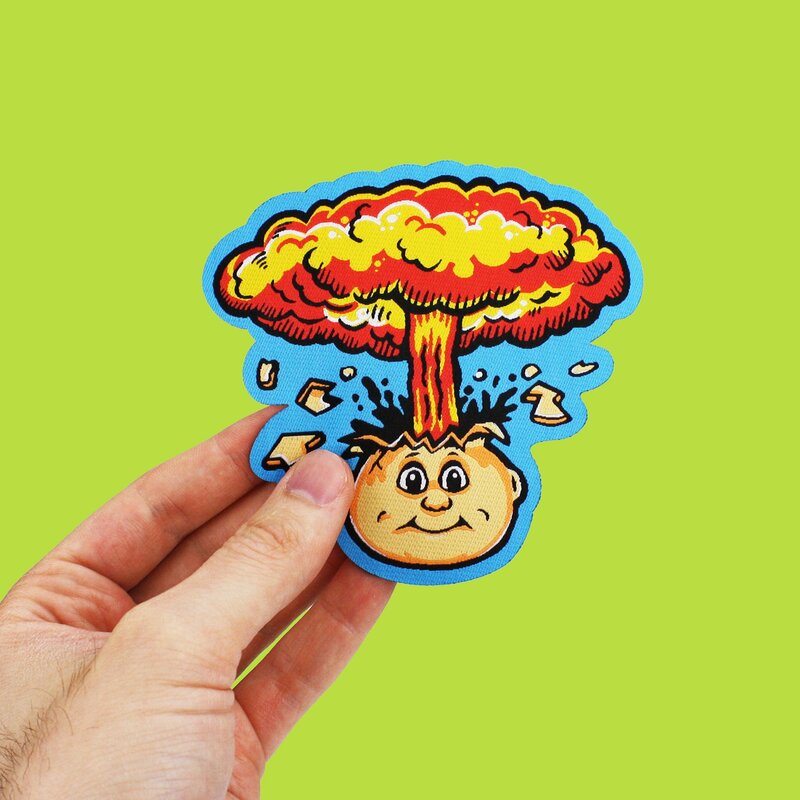 You also get an Adam Bomb poster. All of this come and in a replica OS 1 box. This is available for $49.99. 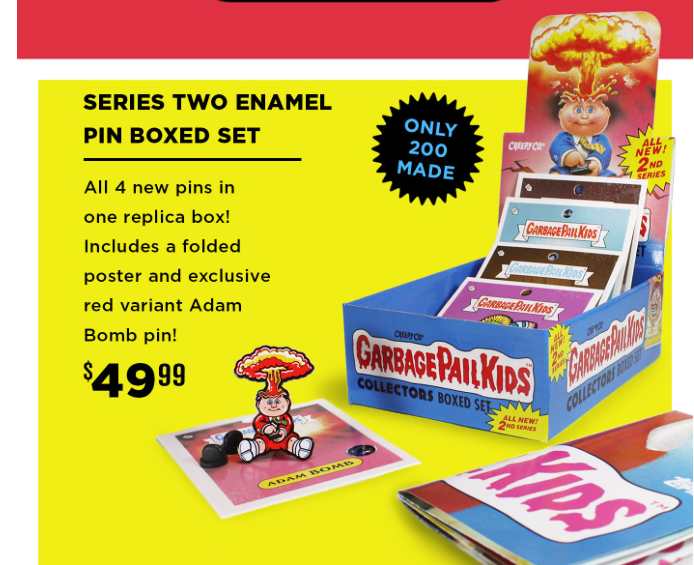 Series 2 Enamel Pin Boxed Set. This is what the tease was that’s available in the OS 2 replica box. The box will come with 5 new enamel pins. 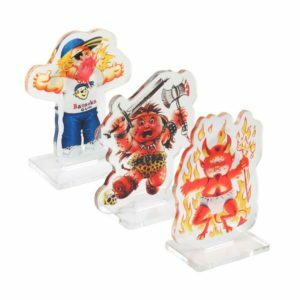 Inside the box will be a red variant Adam Bomb pin, in addition to new pins featuring New Wave Dave, Bony Tony, Richie Retch, and Ned Head. Also inside the box is a Bony Tony poster. 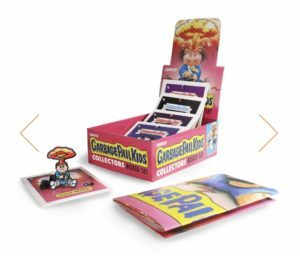 The box will cost $49.99, and be limited to 200 made. 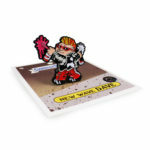 Additionally the 4 new pins are available to purchase separately for $11.99 each. Adam Bomb Coach Jacket. 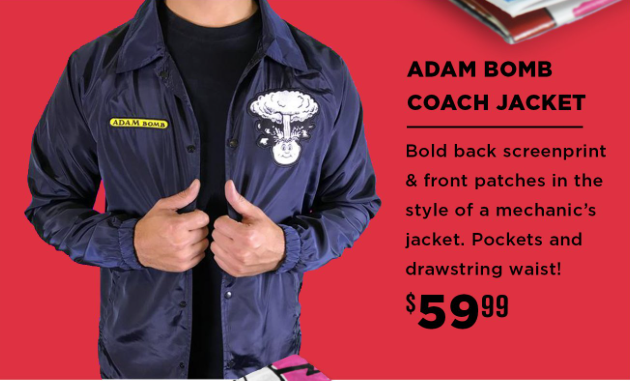 The jacket is a button up front featuring an Adam Bomb patch, and nameplate patch on the front. There is a large Adam Bomb picture on the back of the jacket. 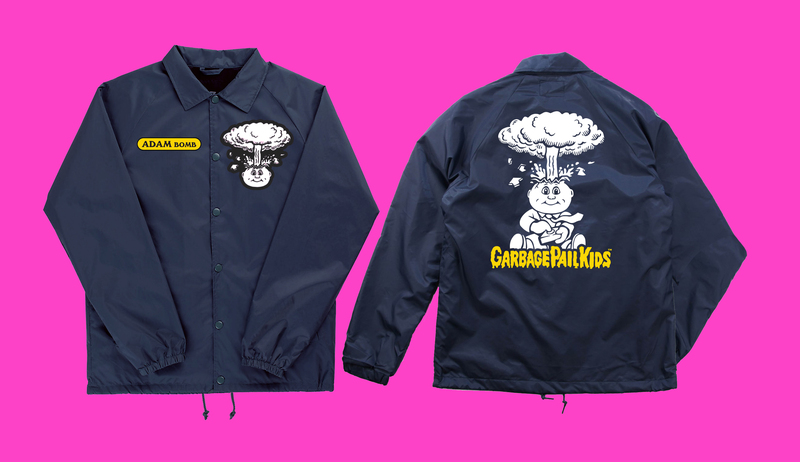 The jacket will be available in sizes S-3XL. The jacket will sell for $59.99. The jacket will not be shipping until 12/15. 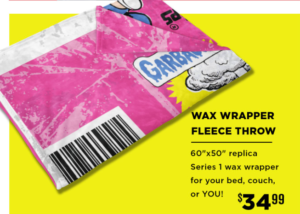 Wax Wrapper Fleece Throw. 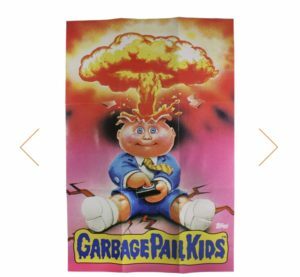 This 60″ X 50″ fleece blanket is a replica of the OS Series 1 wrapper. The blanket will set you back $34.99. 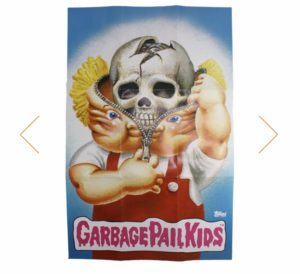 THe blanket will not ship until 12/15. 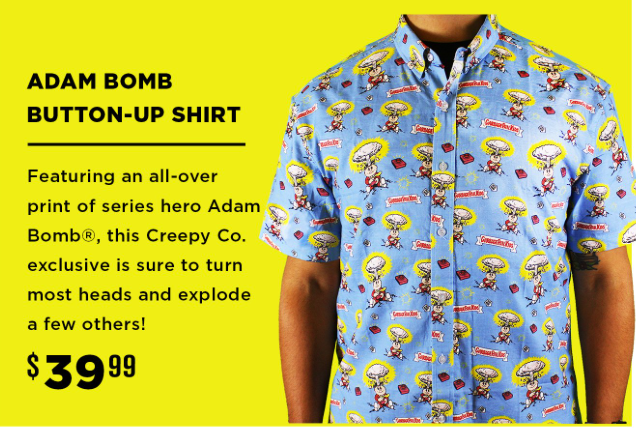 Adam Bomb Button-Up Shirt. 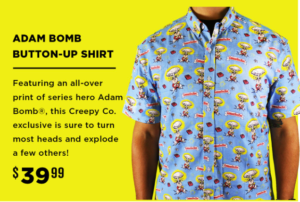 The shirt features artwork from the Imperial Toys line, with Adam in a red suit. 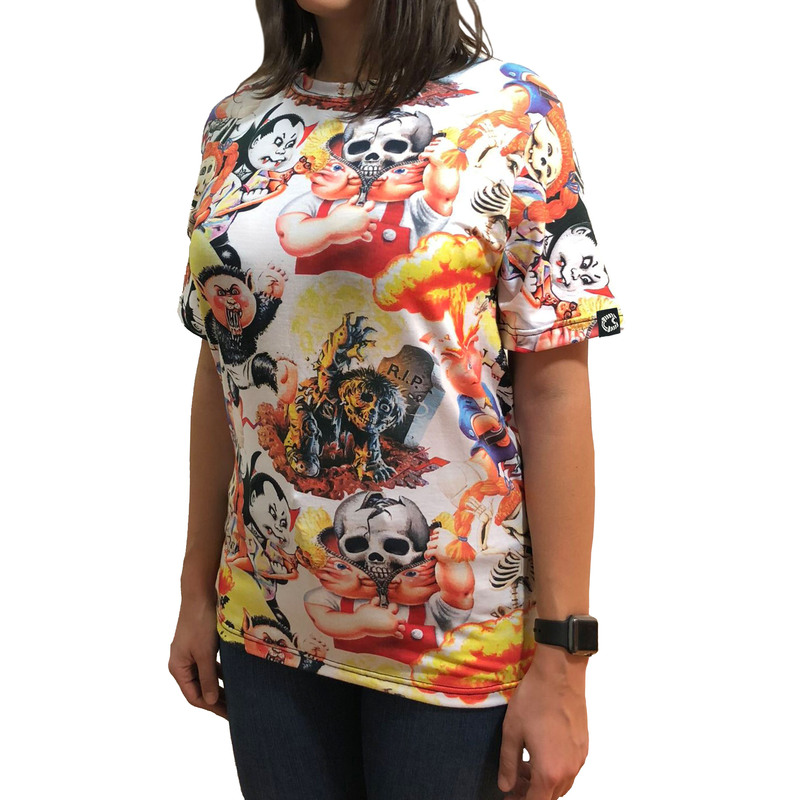 The shirt will be available in sizes XS – 3XL. The shirt will retail for $39.99. The shirt will not ship until 12/12. Acrylic Zipper Pulls. These replica zipper pulls are based off the Imperial Toys Zipper Pulls from the 80’s. 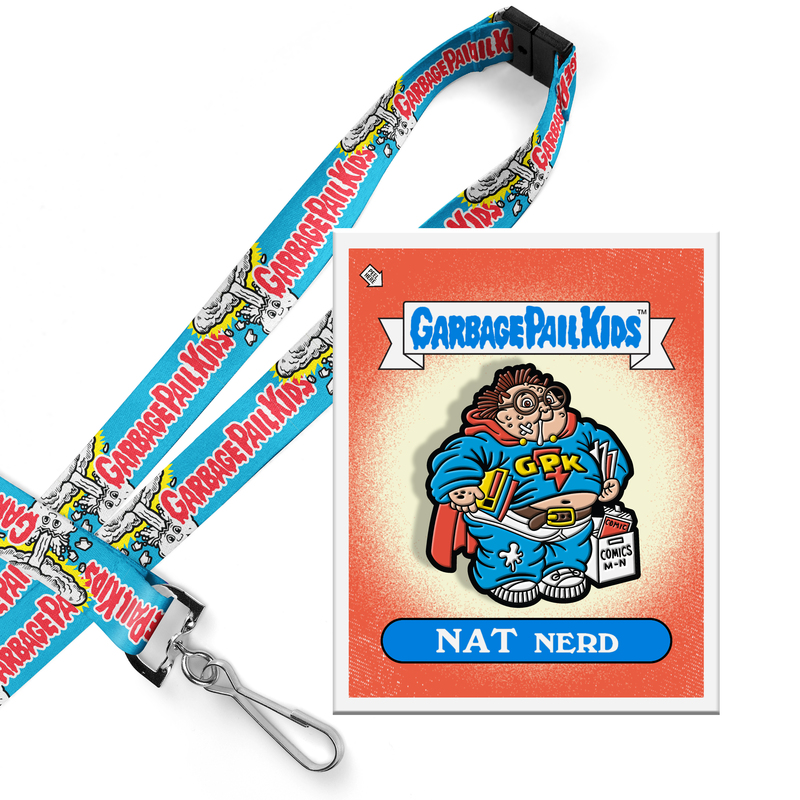 There will be 12 different ones available in bling bags. 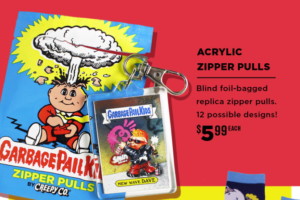 According the the company buying 12 bags will not guarantee collectors a set as they will be completely random. 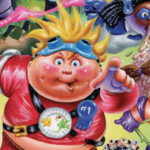 So far the characters revealed in a picture posted by Creepy show; Joe Blow, Ghastly Ashley, Adam Bomb, Junky Jeff, Nasty Nick, Bony Tony, Corroded Carl, Potty Scotty, New Wave Dave, Junky Food John, and two more that haven’t been revealed. Each bag cost $5.99. Socks. Finally Creepy Co. is offering two different pairs of GPK socks. 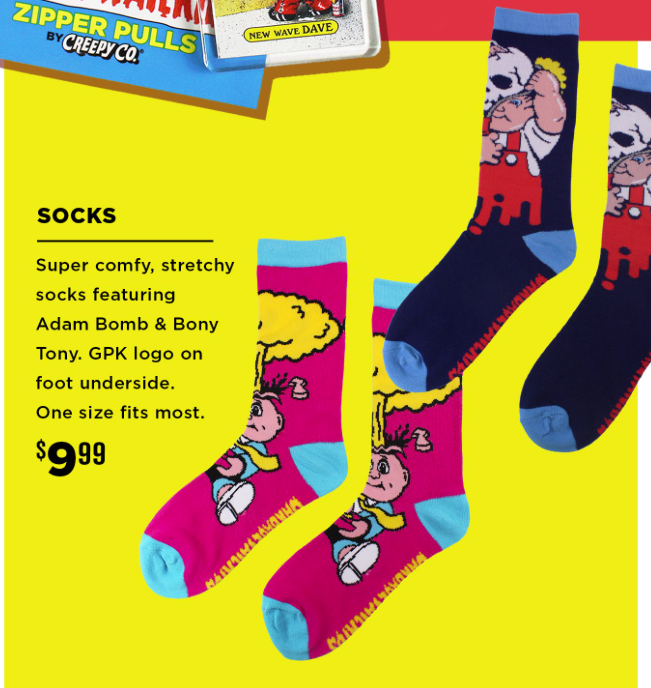 These one size fits most socks will be available in either adam Bomb or Bony Tony versions. Each pair will cost $9.99. Time to get that special someone in your lift some GPK merchandise this Christmas!